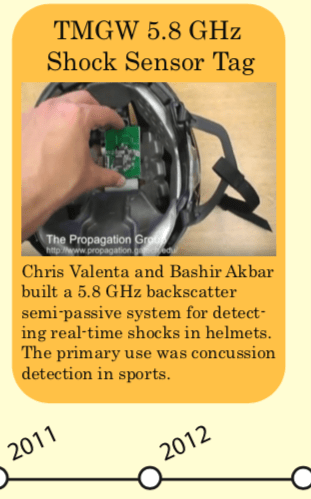 Chris Valenta and Bashir Akbar built a 5.8 GHz backscatter semi-passive system for detecting real-time shocks in helmets. The primary use was concussion detection in sports. In 2012, students Chris Valenta and Bashir Akbar put together a prototype 5.8 GHz backscatter sensor that was able to pull real time shock sensing data from the helmet of a sports player. Using a reader mounted on the side of a field, the microwave backscatter system grabbed 6-axis accelerometer and gyrometer data from a low-powered, micro controller-based system that ran off of a small coin cell battery. Variations of this system would serve as the template of future microwave backscatter radios. Fun fact #1: The project was sponsored at the time by a small start-up named Thingamagigawerks. Fun fact #2: A video of the helmet system in action can be seen here.